Breakthrough StarshotAn edited photo of a prototype ‘sprite,’ a type of spacecraft that was launched into orbit by Breakthrough Starshot. Breakthrough Starshot, an ambitious project to explore a nearby star system, has launched its first prototypes into orbit. Each “sprite” spacecraft is about the size of a cracker and is equipped with a radio, computer, and other instruments. The feat is a step towards developing even smaller and more capable “starchip” robots. 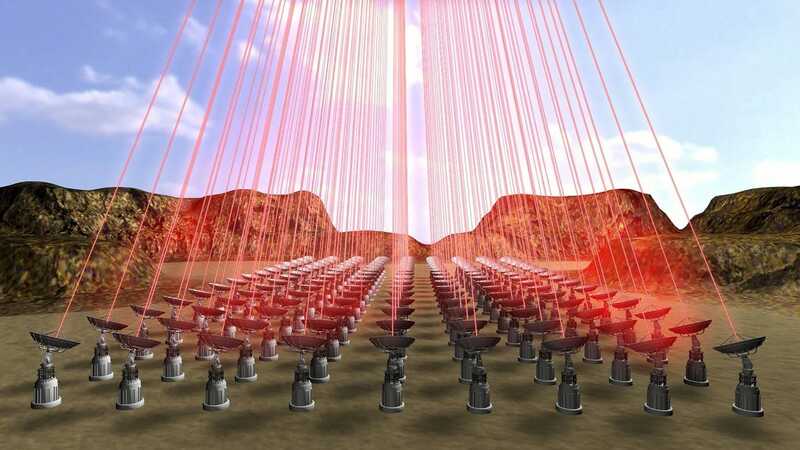 Starchips may be propelled by lasers to the nearby Alpha Centauri star system within two to three decades. Breakthrough Starshot, a Russian billionaire’s $US100-million effort to explore the closest star system to our own, has launched the smallest-ever spacecraft into orbit around Earth. 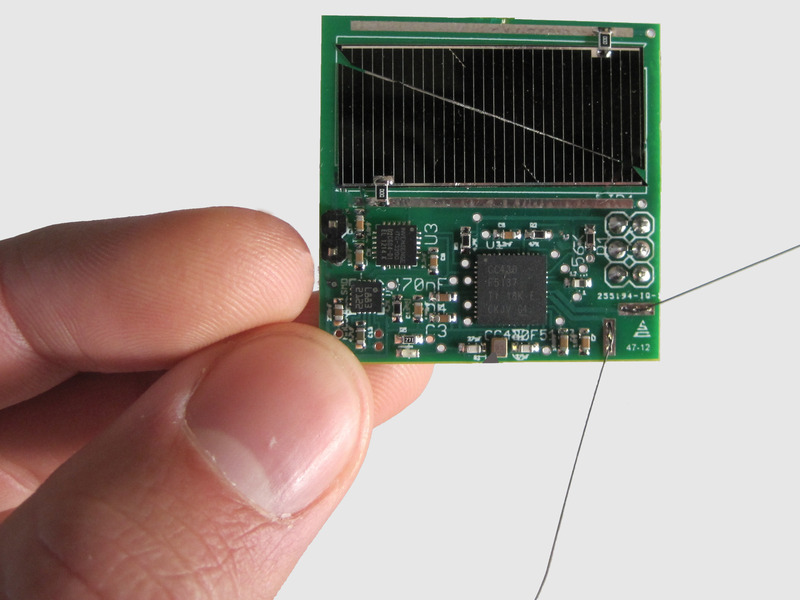 The six cracker-size robots, called “sprites,” are printed circuit boards designed to survive in space. Each one comes equipped with tiny solar panels and two antennas, plus a tiny radio, computer, gyroscope (to move and stabilise the craft), and magnetometer (to orient to Earth’s magnetic field). Each sprite is wafer-thin, measures about 12 square centimeters (1.9 square inches) in area, and weighs the same amount as four US dollar bills. As reported by Scientific American, Starshot launched six of the sprites on June 23 aboard two European satellites on an Indian-built rocket. “This is a very early version of what we would send to interstellar distances,” Pete Worden, a former director of NASA’s Ames Research Center and Starshot’s executive director, told SciAm. 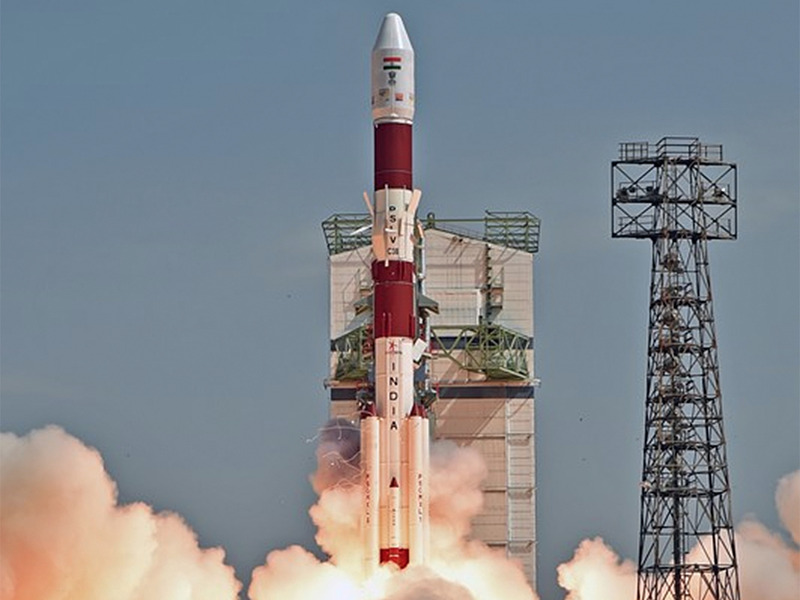 Copyright of ISROIndia’s PSLV-C38 mission launches toward space. Two of Starshot’s sprites are attached to small educational nanosatellites: the Venta (operated by Latvia) and the Max Valier (operated by Italy). Four more await deployment inside the Max Valier, according to SciAm. The fact that they seem to work in space is a big advance for Breakthrough Starshot — an ambitious, decades-long project announced in April 2016 by Stephen Hawking and Russian physicist and venture capitalist Yuri Milner. The ultimate goal, perhaps within the next 20 to 30 years, is to propel even smaller spaceships, called “starchips,” to 20% the speed of light with powerful, Earth-based lasers. Breakthrough Starshot’s general target is Alpha Centauri, the closest system of stars to Earth, which is located about 4.37 light-years (25.7 trillion miles) away. 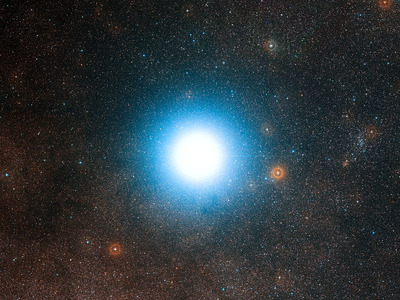 Within that system, researchers are eyeing Proxima Centauri: a red dwarf star that’s about 1 trillion miles closer than two other stars in the system. Proxima Centauri is thought to harbour an Earth-size planet, called Proxima b, in its Goldilocks-like habitable zone. “A spacecraft equipped with a camera and various filters could take colour images of the planet and infer whether it is green (harboring life as we know it), blue (with water oceans on its surface) or just brown (dry rock),” Avi Loeb, a physicist at Harvard University and a Starshot mission advisory committee chair, told Business Insider in 2016. ESO/Digitised Sky Survey 2 Acknowledgement: Davide De MartinA wide-field view of the sky around the bright star Alpha Centauri. The photos of Proxima b would take at least 4.24 years — the distance in light-years from here to the star — to get back to Earth. Milner said in April 2016 that Starshot will start out as a $US100 million engineering proof-of-concept to design, build, launch, and propel a small fleet of starchips to Alpha Centauri in about 25 years’ time. Each starchip will contain a laser-light sail for propulsion. “This is the Silicon valley approach to spaceflight,” Milner said at the time. The starchips will be built out of a “gram-scale” silicon wafer that’s “carrying cameras, photon thrusters, power supply, navigation and communication equipment, and constituting a fully functional space probe,” Milner added. Moving each starchip along will be a “Lightsail” propulsion unit. An array of powerful lasers called a “beamer” will take aim at the Lightsails, accelerating each tiny spacecraft to more than 134 million mph. Starshot wants to launch hundreds of starchips because there’s safety in numbers: At 20% the speed of light, hitting even the tiniest speck of space dust could obliterate a robot. ESO/M. 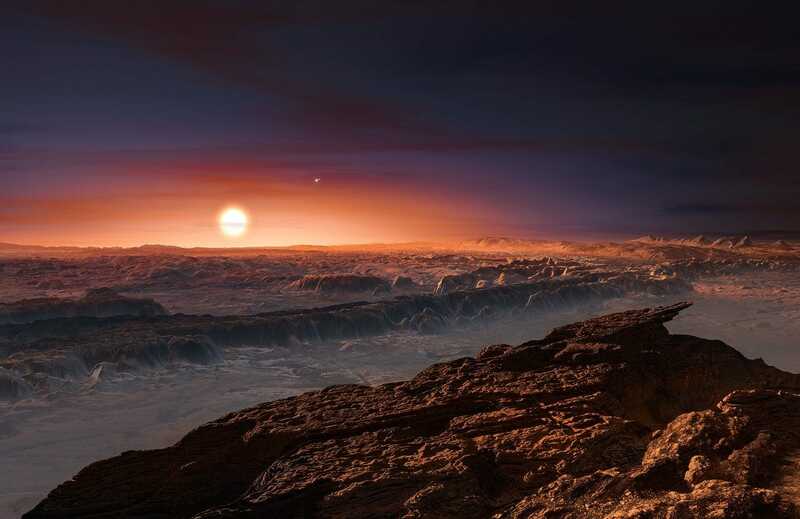 KornmesserAn artist’s impression of the surface of the extrasolar planet Proxima b. “This will allow us to send a fleet of probes towards Proxima that could relay the images taken back to Earth more easily (from one spacecraft to the next along the line of sight to Proxima),” he said. Even if the mission is a smashing success, Starshot may discover that Proxima b doesn’t support life. Loeb said it’s important to explore the not-so-distant world regardless. Milner’s fascination with space and science runs deep. Milner has also spent big money on science initiatives before, saying he wants to celebrate “intellectual achievement” in the same way we celebrate artistic and athletic prowess. The Russian billionaire philanthropist has collaborated with Hawking in the past — in July 2015, the two announced a $US100 million plan, called “Breakthrough Listen,” to search the stars for intelligent extraterrestrial life. Milner was working on a PhD in physics before he became a Silicon Valley investor. He earned his fortune investing in companies like Facebook, Twitter, Spotify, and Groupon.